Sweet Pea is the first confirmed shark ray to become pregnant outside the wild. NEWPORT, Ky. – Newport Aquarium announced Saturday that Sweet Pea, the first shark ray to go on display in the Western Hemisphere, is pregnant – marking the first time a shark ray has become pregnant while in a controlled environment. This historical achievement was made possible through Newport Aquarium’s revolutionary Shark Ray Breeding Program. Established in February 2007 with the introduction of an extremely rare male shark ray named Scooter, the Shark Ray Breeding Program (SRBP) is not just about reproducing this prehistoric looking fish. “The goals of the program go beyond breeding them. We’re striving to learn as much as we can about shark rays,” said Newport Aquarium Animal Health Specialist Jolene Hanna, who has been studying hormones in the shark rays since the program’s inception. Shark rays (Rhina ancylostoma) are rare, distinctive fish from the Indo-Pacific region. Feeding mostly on crabs and shellfish, they live near the coast and offshore reefs in tropical waters. Very little is known about this species that receives its name because their wide head area resembles a ray, while the rest of their body resembles a shark. 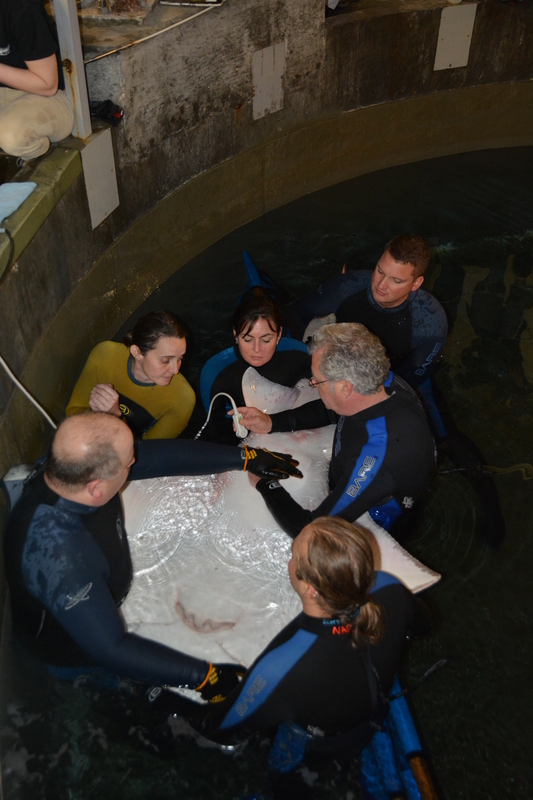 After an ultrasound performed by Dr. Peter Hill and the Newport Aquarium husbandry staff confirmed her pregnancy on Jan. 8, Sweet Pea was taken off display and moved to an offsite facility in Northern Kentucky, where she will remain for the duration of the gestation period. The ultrasound equipment was on loan from the University of Cincinnati FETCHLAB in the College of Allied Health Sciences. An ultrasound performed on Jan. 8 confirmed Sweet Pea’s pregnancy. Dr. Hill speculates that Sweet Pea could give birth to around a half a dozen pups. However, Newport Aquarium biologists are tempering expectations due to the unchartered territory of shark ray reproduction. “As excited as we are, there’s still a lot of work to do. There are many challenges and unknowns to overcome,” said Scott Brehob, who along with Jen Hazeres are the two biologists that take care of the shark rays on a daily basis. The World Conservation Union (IUCN) lists shark rays as vulnerable to extinction on its Red List of Threatened Animals. Threats to shark rays include habitat destruction, pollution, overfishing and the use of their fins for products including shark fin soup. Upon Sweet Pea’s arrival at Newport Aquarium in June 2005, there were just five institutions in the world with shark rays. Today that number has increased to 25 institutions. 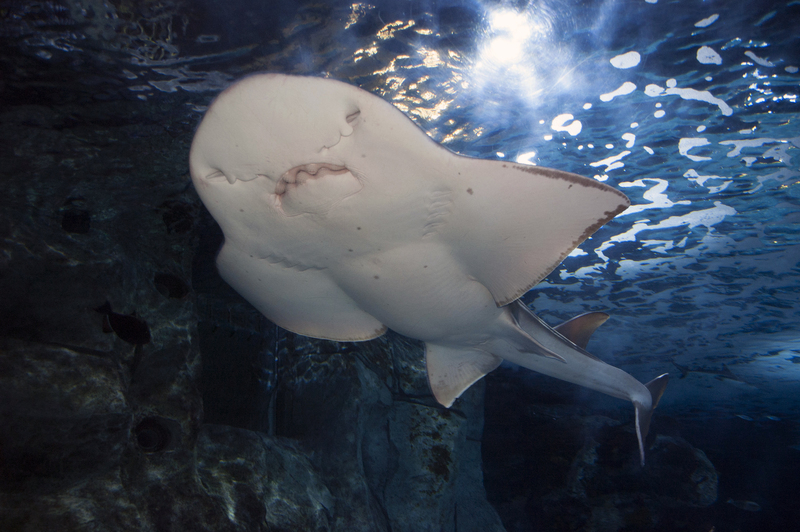 Currently, Newport Aquarium has four total shark rays after the introduction of a second female shark ray, Sunshine, in 2007 and a second male, Spike, in 2013. For the most up-to-date information on Sweet Pea’s pregnancy visit www.NewportAquarium.com, like us on Facebook and follow us on Twitter. This entry was posted in Uncategorized and tagged pregnant, shark ray, Sweet Pea by NewportAquarium. Bookmark the permalink. Thats such awesome news! I am so happy that she is finally expecting a baby! Me and my husband are fans of those animals and are thrilled that she achieved a miracle. We will be sure to stop back by and visit her and her newest arrival.